I have written some new recipes for the Good Food Channel website. 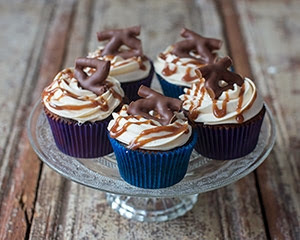 The first recipe I’d like to share with you is for these Curly Wurly cupcakes. 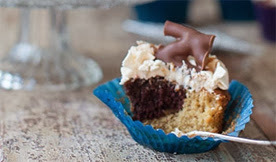 Chocolate and vanilla marble cake is very popular in my house, but I have adapted it here to give the cupcakes a bit more of a toffee flavour. I also melted down some Curly Wurly and added cream and a little sugar to make a yummy toffee sauce, which I added to my buttercream, saving some to drizzle on top as well. Please visit the Good Food Channel website to see the recipe in full. Beautiful! I think I saw these on Katie's instagram feed the other day. I just sent them to a massive cupcakes Pinterest board so hopefully lots of people will visit your post for GFC.